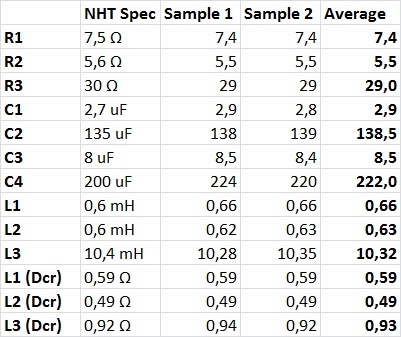 Part 4 of the NHT 2.5i review contains the dissection of the cross-over and some cross-over simulations. 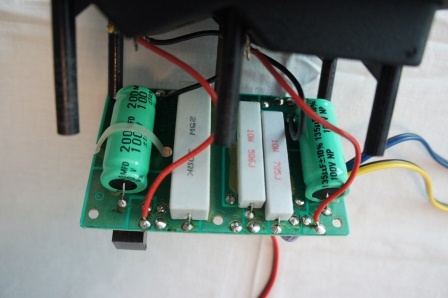 The cross-over components is mounted on a double sided circuit board attached on the backside of the 5-way binding post. The cross-over is rather minimalistic with few components. The tweeter cross-over filter section consists of one resistor (R1) together with an electrical second-order (C1 + L1) high-pass filter that shapes the cross-over slope to a LR4 roll-off with a targeted 3.3kHz cross-over point. 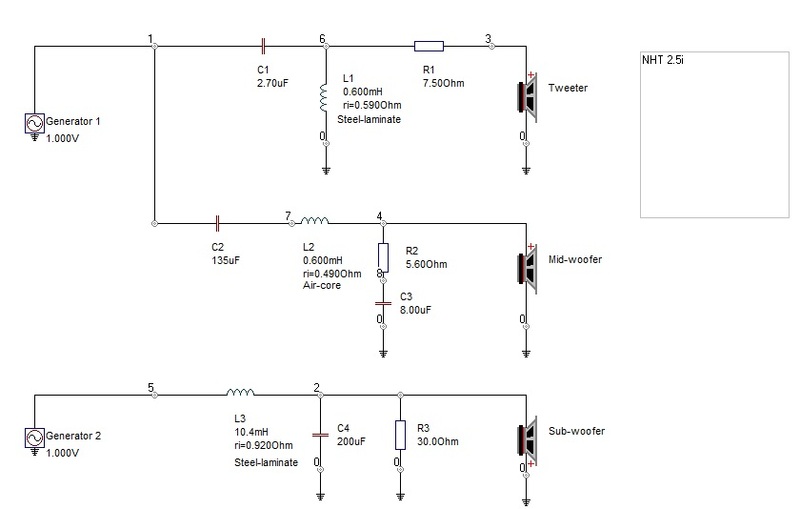 The mid-woofer cross-over filter section have an electrical first-order (C2) high-pass section and an electrical first-order low-pass section, which consists of a coil (L2) paired with an impedance equalization circuit (R2+C3) that shapes the cross-over slope to a LR4 roll-off with a targeted 3.3kHz cross-over point. The sub-woofer cross-over filter consist of an electrical second-order (L3+C4) low-pass section together with a resistor (R3) in parallel with the sub-woofer. The sub-woofer is connected with reverse polarity. 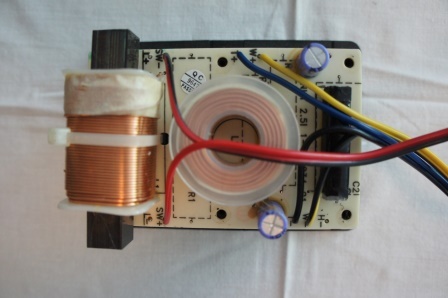 The cross-over components consist of ceramic resistors, electrolytic caps, steel laminate coils (L1+L3) and an air-core coil (L2). They are of simple, but fair quality and are in fine condition. The caps (C1+C3) have a +/- 5% tolerance, while the caps (C2+C4) have a +/- 10% tolerance. They all seem to be within acceptable tolerances even though more expensive components would probably have better compliance with the specification. I can’t see any other reasons but space and cost saving reasons why the (L1) uses a steel laminate coil rather than an air-core coil. It wouldn’t fit on the circuit board if it used an air-core coil. 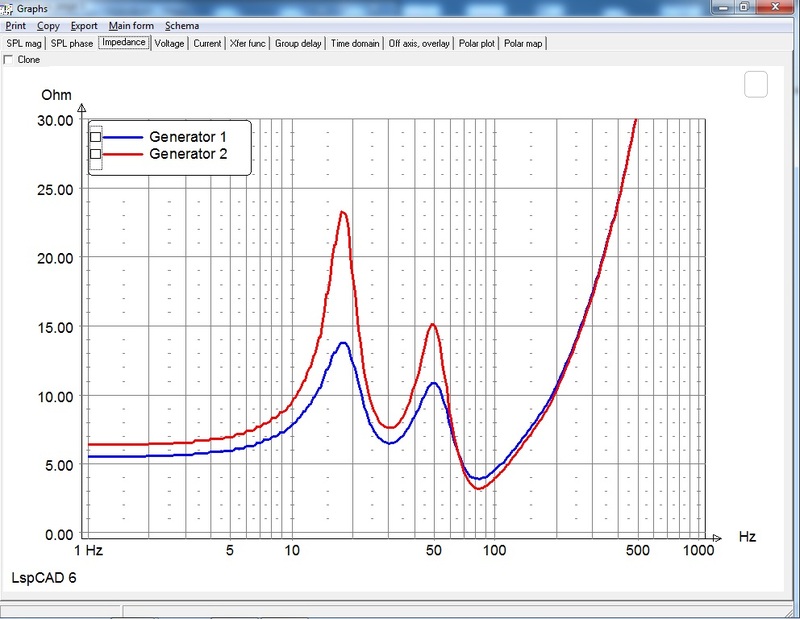 The cross-over simulations below are made using the raw in box driver measurements and simulates the on-axis frequency response at a 3m listening distance. 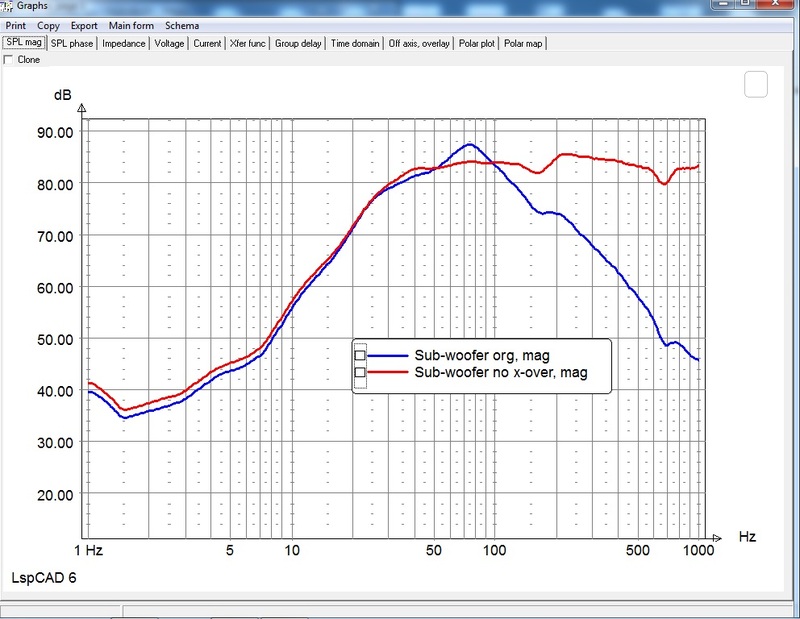 The sub-woofer frequency response are made of the summed near field response of the sub-woofer and port. The shown sub-woofer frequency responses don’t include the influence of the room. 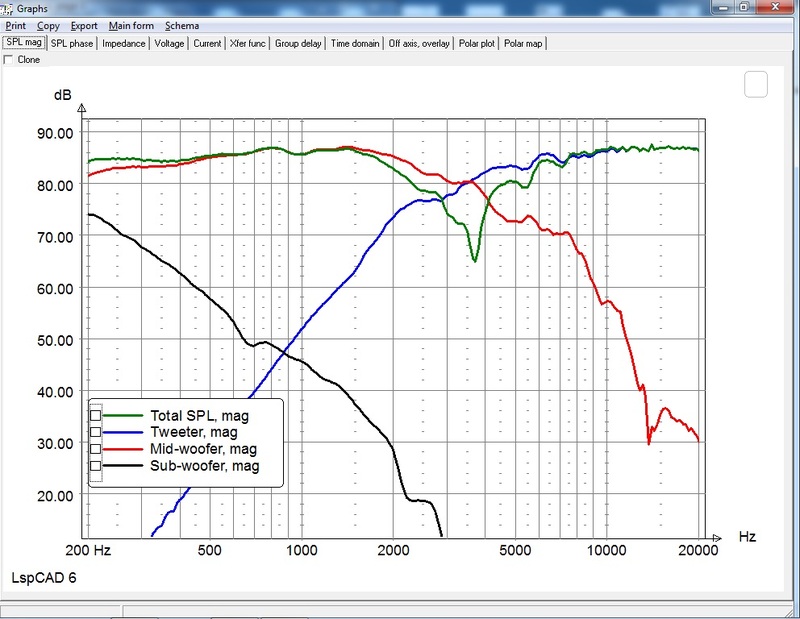 Middle left: On-axis response @ 3m, mid-woofer height. 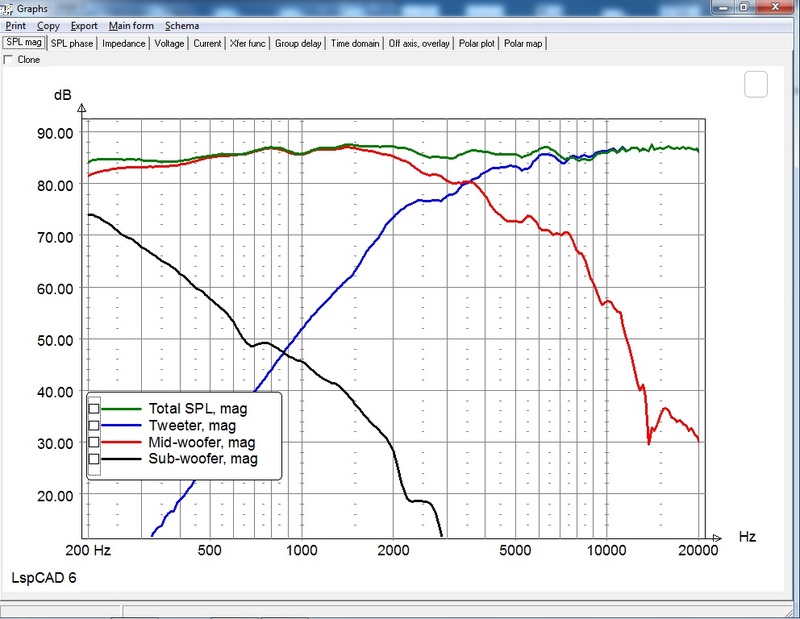 Middle right: On-axis response @ 3m, 11cm above mid-woofer. Lower left: On-axis response @ 3m, mid-woofer height, tweeter reverse polarity. 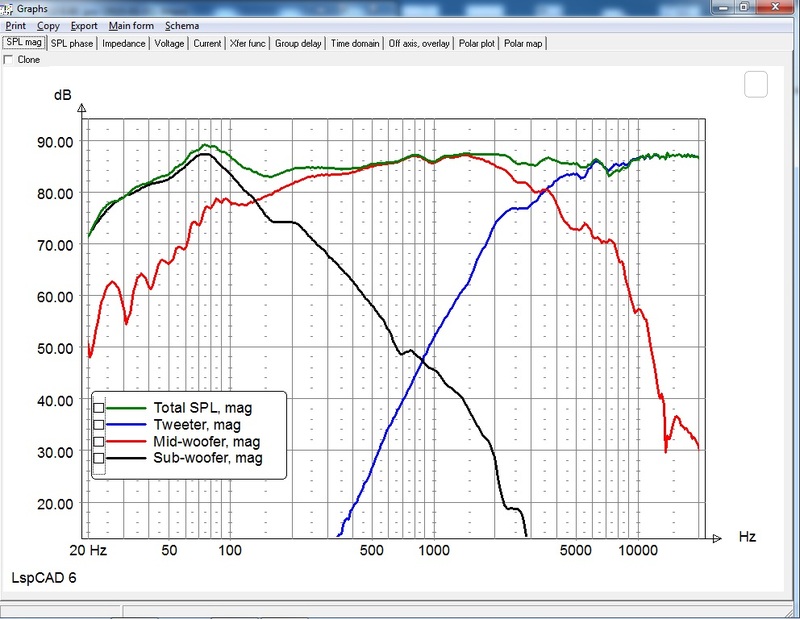 Lower right: On-axis response @ 3m, 11cm above mid-woofer, tweeter reverse polarity. The optimal listening height is about 10-12cm above the mid-woofer center. The reverse polarity simulation shows a deep reverse null indicating a good phase tracking between the tweeter and mid-woofer. The cross-over point between the tweeter and the mid-woofer seems to be spot on the specified 3.3kHz. 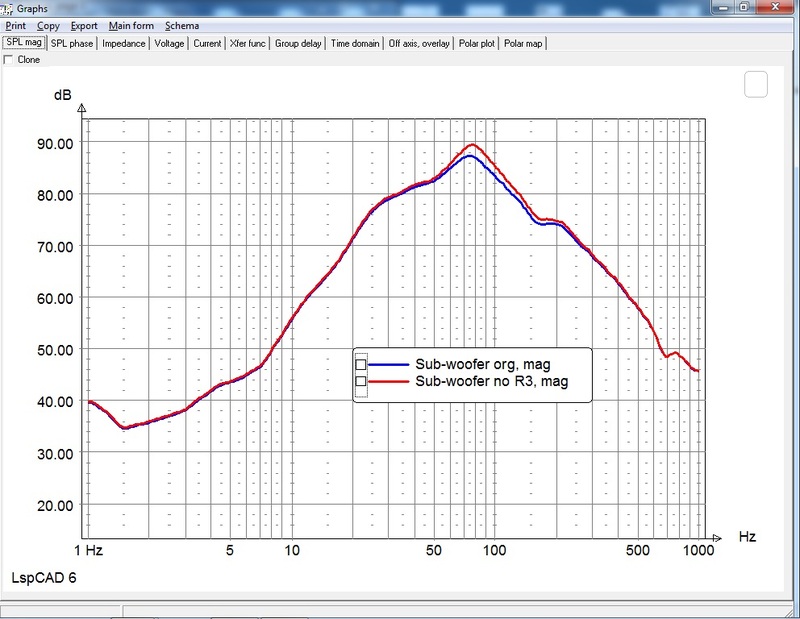 Top: Summed sub-woofer + port nearfield response. Red without x-over and Blue with x-over. Lower left: Summed sub-woofer + port nearfield response. Red without R3. Lower right: Sub-woofer impedance. Red without R3. As can be seen on the above frequency responses the cross-over adds about 3dB centered at 75Hz. If R3 is omitted, additional 2dB is added, but the minimum impedance is also lowered.